“He has sent me to preach the Gospel to the poor,” declared Vincent van Gogh to his brother, Theo, in a letter dated 1876. For the next three years van Gogh singlemindedly pursued his calling to the ministry, first as a student of theology and then as a missionary to the coal miners in the Belgian Borinage. Deeply moved by the poverty surrounding him, van Gogh gave all his possessions, including most of his clothing, to the miners. An inspector of the Evangelization Council came to the conclusion that the missionary’s excessive zeal bordered on the scandalous, and he reported van Gogh’s behavior to church authorities. Although van Gogh was successful in his ministry, the hierarchy of the Dutch Reformed Church rejected him, and at the end of 1879 he left the church, embittered and impoverished. Van Gogh remained in the village after the church withdrew its support, and he began his artistic career by making drawings of the simple life of the Belgian peasants. He described this as a kind of conversion experience: “Even in that deep misery I felt my energy revive, and I said to myself, in spite of everything I shall rise again: I will take up my pencil, which I had forsaken in my discouragement, and I will go on with my drawing. From that moment everything has seemed transformed for me.” Although most of van Gogh’s biographers view this transition as a rejection of religion, in fact art rather than preaching became van Gogh’s chief form of religious expression. His faith in God and eternity, as well as his respect for unadorned piety and the word of God remained firm. One fourth of the twenty highest priced paintings ever sold were paintings by van Gogh. The total selling price of just those five paintings is over a half billion dollars in today’s value. In his lifetime, however, van Gogh made practically no money at all from the work which was his passion. It has been said that he never sold a single painting, and though that is an exaggeration, he sold very little and had to depend on his brother Theo’s good will and financial support to survive. But van Gogh believed in his work, believed in making the best use of the gifts God had given him, and he persisted with an intensity that at times drove him mad. The exact nature of his mental illness is not known, but he spent time in mental institutions and died at the age of 37 of a self-inflicted gunshot wound. 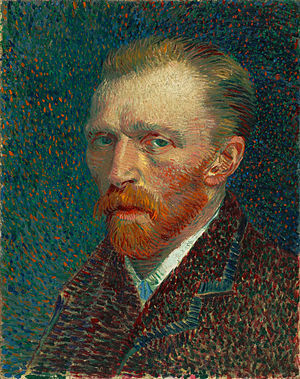 Despite the lack of recognition in his lifetime, Vincent van Gogh became one of the most influential painters of the 20th century and his works are among the most valuable and widely recognized in the world. Ecclesiastes 9:10 — Whatever your hand finds to do, do it with all your might, for in the realm of the dead, where you are going, there is neither working nor planning nor knowledge nor wisdom. Proverbs 16:3 — Commit to the Lord whatever you do, and he will establish your plans. A PRAYER FOR MEALTIME: We thank you, good Lord, for this food which is ours by your goodness. May the strength that comes through the food you give us enable us to do your will, serving you in such a way that we may show our gratitude. Amen.